Generally when a deal is too good to be true, it often is. In this case the deal is legitimate and helps many MobileMe users take the next step to becoming iCloud users. The offer does not extend to non-MobileMe subscribers. 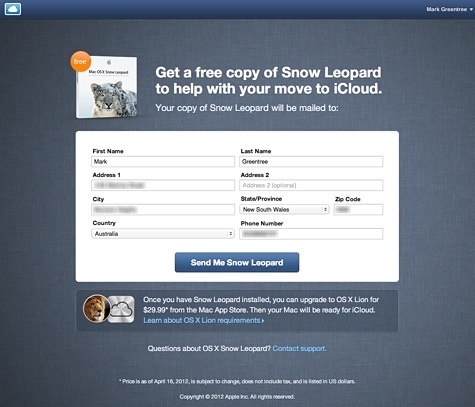 It is interesting to note that even though I have already made the transition to iCloud from MobileMe, Apple is still willing to send me a free copy of Snow Leopard. As with all new systems there is a catch. The upgrade rarely works seamlessly without additional effort on behalf of the user. In order to use iCloud you will need a Mac capable of running OS X Lion along with iOS 5 on your iPhone, iPad, or iPod touch. Windows 7 and Vista (Service Pack 2 or later) users are also supported. For more information on the specific requirements of iCloud and its associated services please see Apple’s Knowledge Base Article: HT4759. Your details will be automatically filled out. After confirming they have not changed simply click on Send Me Snow Leopard. 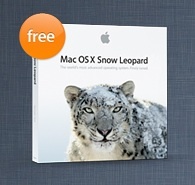 Apple will then send you out a free copy of the Snow Leopard operating system that normally retails for US$29.00. Whilst you will receive Snow Leopard for free you will still be required to purchase Mac OS X Lion for $US29.99 via the Mac App Store, or on a USB Thumb Drive for $69.00 should you wish to have a physical copy. This additional operating system is required because iCloud compatibility is only available for users of OS X Lion. Once those steps are complete you will be able to easily move your existing MobileMe account to an iCloud account. Simply use your username and password to log into http://www.me.com/move. Upon successful log-in simply follow the onscreen instructions. Prior to upgrading your operating system and migrating between services please make sure you have a backup of your Mac, and any associated information attached to your MobileMe account. For details on how to backup your MobileMe account please see Apple’s Knowledge Base Article: HT1813. Three key services that will not be making the move to iCloud are MobileMe Gallery, iDisk, and iWeb Publishing. Upon the closure of MobileMe on June 30th, 2012, all related content and associated information stored via these services will be permanently removed. You can still use all existing MobileMe features until the closure of the service. It is advised you make the transition sooner rather than later to avoid any possible loss of data.